Yesterday I had the delightful opportunity to meet Annie of www.inmidreamz.blogspot.com and her husband, Don, at the Tea Zone. Wow! Two bloggers at the Tea Zone in July. What a fun place to meet new friends and to make new connections. Isn't the internet amazing! Annie was a joy to meet and learn more about her dreams. Thanks Annie and Don for a lovely lunch and visit, I thoroughly enjoyed it. A favorite recipe from Magnolia & Ivy is Microwave Lemon Curd. I have tried other lemon curd recipes in the microwave with good results. The lemon curd has been made and will be used in cupcakes for a special tea I will be serving my Aunt Arlene on Friday. When I was working regularly I said I would take tea to elderly in nursing homes. My Aunt Arlene lives in a retirement community. The retirement community has agreed to let me set up a small table in the garden. I will report back later with pictures. Beat eggs in a glass bowl until frothy. Stir in lemon juice, sugar, and melted butter. Microwave on high for three minutes. Remove and stir with a wire whisk. Microwave again for three minutes. Whish again. Repeat if necessary. Don't forget that mixture will thicken when it cools. Store in refrigerator up to two weeks. Serve in a small crystal dish and garnish with a small fresh pansy or viola. Beside serving it in a bowl, you could use as I will in a cupcake or in a tart shell. I have even heard of lemon curd sandwiches. An article in The Tea Room magazine for July/August 2008 caught my eye. 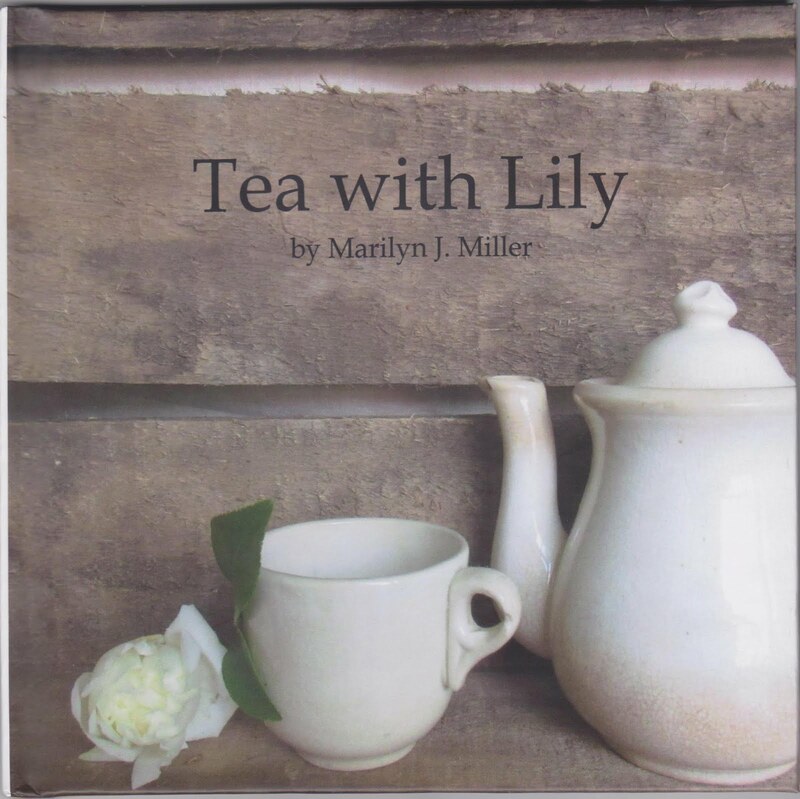 It is by Jacqueline Bodnar and talks about the soothing and relaxing benefits of knitting and tea. To quote Tom McNalley in the article, "They go together well because both are deeply attached to relaxation, aesthetic pleasure and an interest that can go as deep as you want." 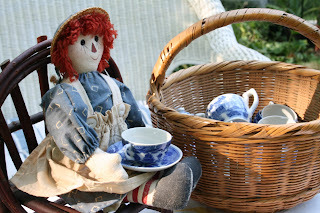 "At the same time both tea drinking and knitting can be great social or meditative activities." It also says one of the most popular knitted items today is the tea cozy. So pick up the knitting needles and brew a pot of tea. Enjoy the moments of meditation and connection with a friend. 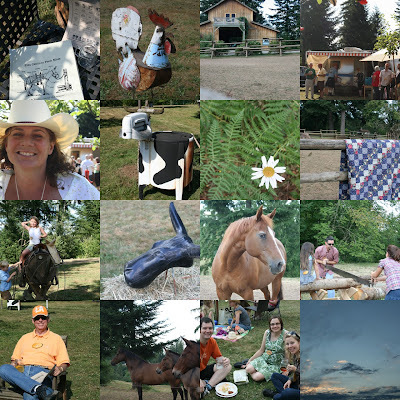 Saturday our hearts delighted in sharin' the dream with our best ever realtor, Kama (the one with the cowboy hat). Kama sold us our home 6 years ago and we are now part of her family. Each leap year she invites all her clients to Titanic Ranch for a day of horses and cowboys. What fun! We were greeted with gifts and given a bingo card to get acquainted with others. The rooster was along the drive into the ranch. Kama and her husband, Ian, live above the horses. The Air Stream trailer was for refreshments, quilts to sit on, the Concrete Cowboys for great music, games for the kid's and adult's, and a delicious barbecue of beef, chicken, salad, corn, beans, and ice cream. We feel so fortunate to have such a great realtor. The sun was setting as we drove away with smiles on our faces. Thanks Kama and the gang for a fun afternoon in the country! The welcome sign at my front door will welcome you as you step onto my front porch. Here is another word in my home - Welcome. Welcome to my home and tea. Come and sit awhile and sip a cool glass of tea. The tea in the glass today is Black Currant Black Tea with a sprig of basil. The sun is shining and it is so peaceful in my yard. Come sit with me. Breathe a deep breath and take in the morning sunshine. What iced tea would you like in your glass? Yesterday I had tea with Stephanie of Steph's Cup of Tea. 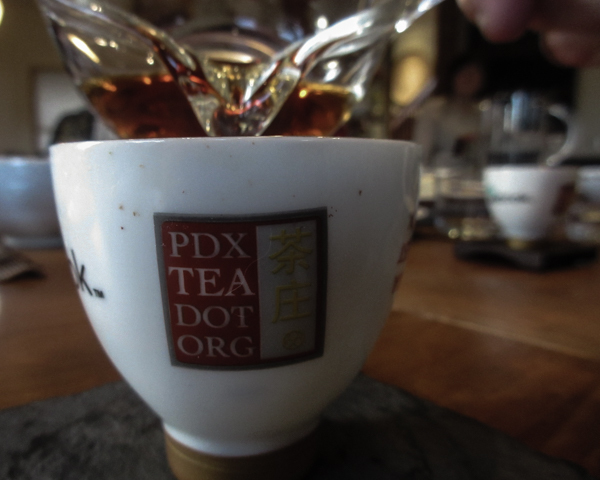 We met at the Tea Zone in Portland for a special time of getting acquainted and sharing our love of tea. 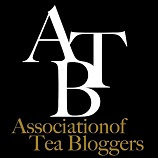 What fun it is to meet fellow tea bloggers and make new connections across the country. Thanks Stephanie for sharing tea with me, I loved it. It was great to get to know you better. Travel well! The Tea Zone is not a Victorian tea room, but a very pleasant place to sit and visit. In the back they have a tea lounge where they served mixed drinks with tea. I always order the same thing when I go there. It doesn't matter what time of the day it is, but I love their Chicken Curry Empanada's. The tea I order may be different, but it is always the same food. Yesterday was a bubble tea day for me, I had green tea with mango. It was yummy and very refreshing. It had been a long time since I had a bubble tea, they are fun to drink and the tapioca bubbles are fun to chew (like chewy gummy bears). The Tea Zone was busy with people coming and going; some staying for awhile. This type of tea room is very attractive to young adults, both men and women. When I worked nearby, I often stopped in for some tea for a break or for lunch. If you are ever in Portland, Oregon I am sure you would enjoy stopping in for a tea break as you shop in the Pearl district. Then if you are really in the mood for more tea it is not far to the Chinese Gardens where they have a Chinese style tearoom after a peaceful walk through the gardens. In the year 2000 I decided to open a tearoom, but knew very little about tea and tearooms. In my research I found Magnolia & Ivy's Tearoomforprofit workshop. I flew off to Georgia for a few days of learning. Then spent a day after that working in the kitchen of Tea and Tomes in Newport, Oregon. I kept wondering what would my tearoom be named. I made a list of things I thought went into a tearoom, including marmalade. I really liked the sound of the word marmalade. Then my son said "well you are the marmalady". He called me Marma when he was little, a combination of Marilyn and Mama. Thus Marmalady's Tea Room, Inc. was registered. Yes, I still was thinking tearoom. Along the way I realized I didn't want to open a restaurant, but wanted to see my products in tearooms across the country. My work background is product development and this just seemed to fit. So the legal name is Marmalady's Tea Room, Inc.; but I do business just as Marmalady's. For me marmalade is more than just marmalade; it is a myriad of colors and textures and incorporates many facets of pretty things. I had no problem saying tea cozies or anything else I might develop would not fit the image in my mind for pretty colors and textures. Jams, jellies, and marmalade's certainly fits. While my children were growing up I made many batches of jams and marmalade's, so this product was easy for me to include in Marmalady's. 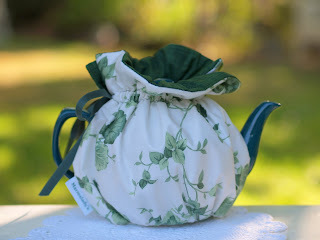 I love finding vintage linens and making them into beautiful things; so of course tea cozies was the perfect fit. My work experience was as a patternmaker; so I am sure that experience will come into play with some future product. My mind is always creating and thinking what next for Marmalady's, including what new flavor of jam or marmalade will be next. 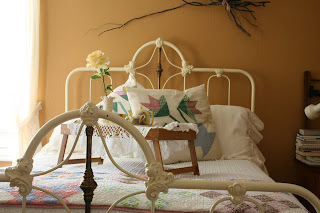 The cozy above is vintage fabric found in an antique shop. The picture was taken by my neighbor, Shayne. Being prepared for tea at the knock on my door. In my mind I always think what would I do if someone came by unexpected to have that cup of tea we had talked about. One recipe that I always have ready is brownies. I am not sure where I received this recipe many years ago, but it is so convenient. Marmalady's Cherry Amaretto jam or another jam can be swirled through the brownie batter before placing in the oven for an extra special touch. Are there days you would love to be served breakfast in bed? I do think of having breakfast in bed, but what do you do with the crumbs from that lovely piece of toast or scone? Would my lovely tea spill? 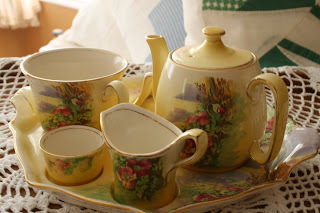 The breakfast tea set was a birthday gift from my husband last year. It is yellow, my favorite color, and has garden scenes. Now wouldn't that be lovely to use for breakfast in bed. I can have fantasies of breakfast in bed, but so far that is as far as it has gone. I even have the pile of books next to my bed. Ahhh! Dreaming of the luxury of sitting in bed with breakfast and books. Delicious! I think I must plan breakfast in bed one of these days. I would have a lovely oolong tea, maybe Oriental Beauty, also a couple freshly baked cream scones with jam (of course Marmalady's!) and cream, maybe some fresh strawberries too. Joy is an emotion of great delight or happiness. The above JOY is hung in my dining room each Christmas, but this year I decided to leave it up all year. The word joy reminds me to take notice of each delight of the day. Tasha Tudor use to say "Take JOY". I tried growing Alpine Strawberries once. I didn't take care of them and they died. Last September I visited a friend and she had a pot of them sitting near her back door. I was re-inspired to try again. 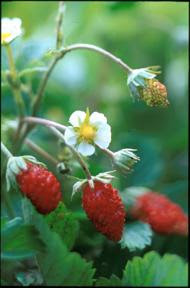 In the spring I found a large pot of Alpine Strawberry plants at the Farmer's Market. The strawberries have been sitting by my back door this summer in full sun. They are very happy and have produced many little berries. What a joy to stop by there each day and pick a few, popping them in my mouth. They are very tasty for such a small berry. The last time I was in Paris several sidewalk produce stands had Alpine Strawberries in little baskets. The berries were placed in neat rows and beautifully displayed. I can't even imagine taking the time to place them so neatly. It takes so many little berries to fill a basket. Only the French would take the effort to display them so beautifully for the market place. Alpine Strawberries bring me joy to my soul and to my mouth. My Lord, I loved strawberry jam. We have so many ways of communicating. What do we want others to know about us? How are we feeling? 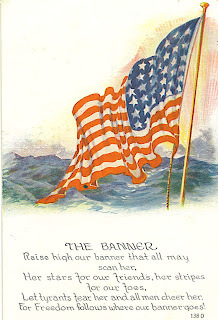 We can get a message across by the way we stand, move our hands, make facial expressions, or words. We can write words or say words. Recently I have noticed how much I love words. They can say a lot or a little; they can express emotion or just to send a message. Looking around my house I see alot of words. Do you have words in your home? What do they say? Do they show a little about who you are? 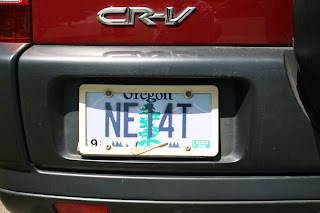 Here is the license plate on my CR-V. Can you tell anything about me from this plate? First it shows I live in Oregon. Then there are some letters and numbers. What do they say and what do they say about me? A hint: read each letter and number separately. Thanks to Denise at Uniquely Tea for giving me the idea for my plate. It came from her brother originally and he has the same plate only in a different state. Now there is one more thing that my license plate says about me. Do you see it at the bottom? The frame has a Nike swoosh on it. When I was hired at Nike, each new employee is given a license plate frame. So just by my license plate on my car you can tell many things about me. Did you figure out the letters and numbers? It says: Any one for tea. I hope you guessed it. It gives me joy each time I see it because tea and sharing tea are special to me. Yesterday my husband and I threw a garden party in our backyard to celebrate our retirement this year. 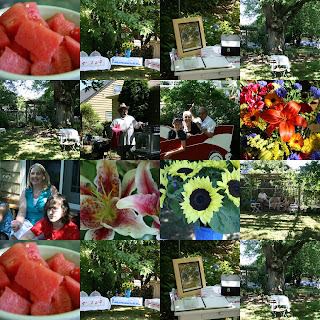 We had about 70 people stop by to extend their congratulations and enjoy old fashioned hotdogs, snocones, salads, drinks, and sunshine. It was so fun to greet friends, people we have worked with, and family. Our backyard is very shady and was perfect for a warm summer afternoon. The snocones were a great cooling dessert. How fun it is to be able to eat all the snocones you could possibly want. We also had beer, lemonade, and of course iced tea. I made several gallons of Monk's Blend iced tea. Someone said that is the best iced tea they had ever had. Tim, our son, was the chief hotdog cooker and snocone maker. Friends could have their picture taken sitting behind the red convertible. 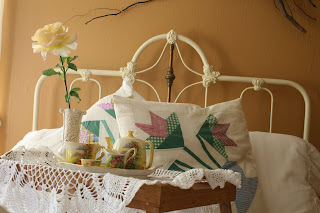 On each table I placed a vintage tablecloth from my collection. I love seeing them out in the yard for special occasions. This was a special occasion. In the bowl you will see Martha's (Stewart) Watermelon Salad. It is always a hit on a summer afternoon. In a small bowl, combine ginger, lime juice, and honey. drizzle with lime mixture. Serve immediately. As we traveled home from the World Tea Expo in June, we stopped for the night at a simple motel in Barstow, California. I went in to see if they had a room and check us in. On the counter in a small frame was the above Golden Rule. I asked if I could have a copy of it and the woman at the desk connected with me in those short moments of life. We had a sweet discussion on each ones similarities in thought and beliefs. My husband asked when I returned to the car if I was bonding with the woman at the desk. I said that we were and I was touched in those moments by sharing with another woman in our sameness. She was from India and I am Anglo American. In our hearts we were the same. 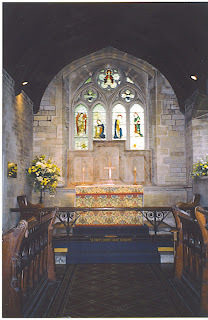 The picture was taken a few years ago at the Flower Church in Lower Slaughter, England. Cleaning my house this week I came across The French Art of Tea book. 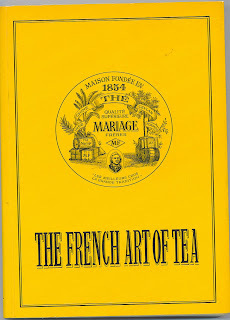 I picked the book up several years ago when having tea at the Mariage Freres in Paris. There are some great quotes and tea history in this book, which I will share from time to time. It is the story of the Mariage Freres French Tea House, which was opened in June 1854 by Henri Mariage and Edouard Mariage. If you ever have the opportunity to visit Paris you must have tea at the Mariage Freres. I plan to have tea there in September and reading through the book I can't wait! 'Tea must be deserved; it is demanding. 'Tea is a noble beverage. 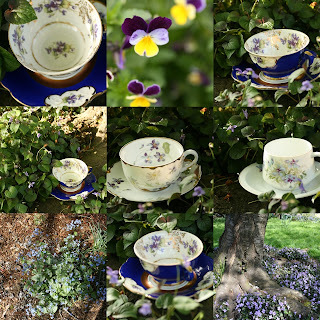 Pictures are from my yard and my violet teacups. The teacup in the center is from a set of china that belonged to my grandfather. my friend there's always time for you. The child's tea set belonged to my sister-in-law when she was a little girl. Recently I was delivering Rose Tea Jelly to the Rose Garden Shop at Washington Park in Portland, Oregon. It was a lovely summer morning with the feel of sunshine in the air. I couldn't help taking my camera along to capture some of the beautiful roses in the rose gardens. The picture in the center reminded me of "Stairway to Heaven". It takes you into the glorious fragrances and beauty of the morning. Oh Take Joy in celebrating the beauty of the morning and roses. I am thankful that thorns have roses." 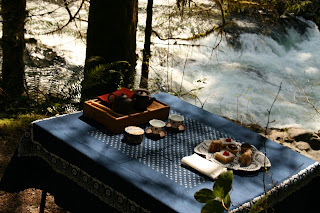 Having tea outdoors is one of my favorite ways to have tea. It brings together two things I love, the outdoors and tea. Each time a tea friend and I have been to the Pomeroy House in Yacolt, Washington we eat the first part of our afternoon tea there then ask to have the sweets packaged up. Taking our sweets we venture off to the river, which is nearby, and set up a table overlooking the river. This spring the river was full and tumbling over the rocks. The sound was like music to enjoy with our tea. We take a small butane stove, which works great to carry along for warming the water. Yummm! The sweets are a perfect treat. What more peaceful surroundings can you find than sitting by a river listening to the sound of the music of nature and sipping tea. Picture taken by the Lewis River. "Here (in Pakistan and Afghanistan), we drink three cups of tea to do business; the first you are a stranger, the second you become a friend, and the third, you join our family, and for our family we are prepared to do anything-even die." Three Cups of Tea, by Greg Mortenson and David Oliver Relin, is a fascinating book describing the connections Greg Mortenson, a mountaineer, made with the Pakistan people and how he came to develop schools in Pakistan. I was thoroughly captured by the story. 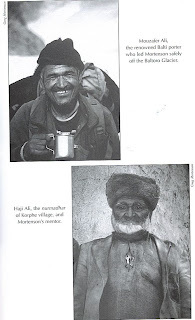 The picture above is from the book showing Haji Ali, Mortenson's mentor, and Mouzafer Ali, the porter who led Mortenson safely off the Baltoro Glacier. The Olympics soon will begin. The gardens are ready with many fun exhibits. 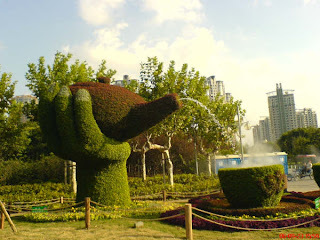 Here in the Beijing Olympic Gardens is a nice cup of hot tea poured from a teapot held by a hand coming from the ground. Enjoy!